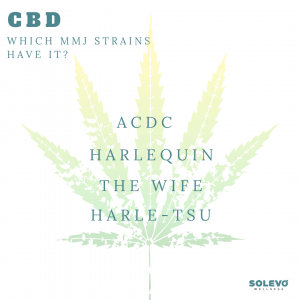 CBD: What MMJ Strains Have It? CBD, short for Cannabidiol, is quickly becoming the most popular and sought after cannabinoid. Whether it be for its health benefits or lack of the psychoactive “high” you get from THC, CBD is becoming a popular choice for everyone from soccer Moms to experienced medical marijuana connoisseurs. **Please Note, strains listed may or may not appear on the Solevo Menu. For a list today’s available strains please click here! Skincare companies, supplement shops and even your friends on FaceBook are pushing CBD products. It is quickly becoming the most marketed cannabinoid. Here, at Solevo Wellness, we see first hand success in treating patients with medical marijuana strains that are high in pop culture’s newest alternative health craze. Strains high in CBD are great for conditions including epilepsy, chronic pain and inflammation. Want to know which strains boast a higher amount of CBD? First, let’s talk about ACDC, a patient favorite. ACDC is an earthy, sativa dominant strain that is extremely high in CBD. The most amazing thing about ACDC is that it boasts a CBD:THC ratio of 20:1. This means patients see relief from symptoms with a completely clear mind. ACDC is great for patients suffering from chronic pain, anxiety, epilepsy, multiple sclerosis, or are suffering from the negative effects of chemotherapy. Next up is Harlequin. Don’t let the name fool you, Harlequin is no joke. This strain is a sativa-dominant strain notorious for its regular ratio of CBD:THC. Unlike other high in CBD strains, Harlequin tends to stay consistent with a 5:2 CBD:THC ratio. Tastes range from earthy to mango, but no matter what your taste buds register this strain will always be good for treating conditions like chronic pain, stress, depression, anxiety and fatigue without leaving you drowsy or loopy. Then we have, The Wife. This strong hybrid strain will have you in love and ready to “wife” it up. The Wife contains nearly a 20:1 CBD:THC ratio and offers patients relief without the psychoactive high. Patients can use this strain to treat a variety of symptoms such as chronic pain, side effects from chemotherapy and migraines. Finally, let’s talk about the hybrid that everyone loves, Harle-Tsu. What is it about this strain that makes patients flock to it? A cross between Harlequin & Sour Tsunami, Harle-Tsu is known for helping to treat chronic pain, stress, depression and fatigue. That’s not even the strain’s biggest selling point. Harle-Tsu boasts a CBD content that is 20 times higher than THC, which makes patients feel enormous amounts of relief while being motivated enough to go about their daily activities. Did this make you want to try some high CBD strains? It should have! Strains high in CBD, that still contain THC are some of the most sought after strains on the Solevo menu. Again, the four mentioned here may not be available today, but they are all strains that we have received in the past or will be getting in the future. No worries, our patient care consultants will be able to help you find a strain that is comparable to one of these if it is not on the menu the day you come in. See you soon!